A common question for metal manufacturers and finishers is how best to protect a metal part from rust or corrosion during temporary storage or shipment. Often, protection takes the form of rust preventative greases or oils that must be cleaned off, discarded as hazardous waste, and reapplied at each stage of inspection or finishing until parts reach the end user. Protective waxed based coatings have also been used very effectively to protect metals in transit, but these coatings are very difficult to remove when the part is needed by the end user. Other temporary coatings may be easier to wash off but not thick enough to adequately cover and protect dynamic metal profiles such as threads or splines. 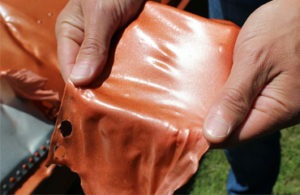 Cortec® has developed an exciting new water-based peelable coating that is easy to apply and remove for temporary protection of metal parts against rust and corrosion. VpCI®-372 E is an extra thick version of a water-based acrylic peelable coating and provides protection in harsh, outdoor, unsheltered applications. The E version is a high-build/high-viscosity product specially designed to protect metal surfaces such as splines, threads, or machined areas that have dynamic profiles. It can be applied to metal surfaces by spraying, rolling, brushing, or dipping and is thick enough not to sag or run off the surface when applied. In one to two hours, the coating is dry to touch. It hardens into a thick covering that protects multi-metals from corrosion and also offers excellent UV resistance. The coating protects freshly machined surfaces against physical abrasion, such as nicks or dents, as well. When the coated metal part reaches its destination, or is needed for use, VpCI®-372 E can simply be peeled off and discarded as solid waste, leaving behind a clean and corrosion free surface. VpCI®-372 E has very low levels of VOC according to ASTM D3960 (0.2 lbs/gal [24 g/L]) and is dry to handle in two to three hours. It has passed more than 1,000 hours of testing in both humidity and salt spray chambers, according to ASTM D1748 and ASTM B117, respectively. VpCI®-372 E can be matched to some custom colors to suit application needs and can be hand-applied to individual parts or used in automatic production line applications.VpCI®-372 E is a unique, user-friendly option to consider for preserving dynamic metal profiles such as pipe splines and other surfaces in the best condition possible. It is an excellent environmentally friendly, easy-to-use alternative to hazardous rust preventatives and other temporary coatings. Cortec® Corporation is the global leader in innovative, environmentally responsible VpCI® and MCI® corrosion control technologies for Packaging, Metalworking, Construction, Electronics, Water Treatment, Oil & Gas, and other industries. Our relentless dedication to sustainability, quality, service, and support is unmatched in the industry. 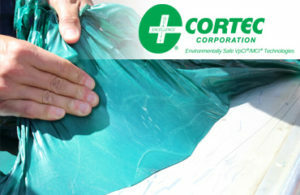 Headquartered in St. Paul, Minnesota, Cortec® manufactures over 400 products distributed worldwide. ISO 9001, ISO 14001:2004, & ISO 17025 Certified.